Stella McCartney says the union flag inspired her designs for Team GB Olympics wardrobe. Stella McCartney continues to enjoy good reviews from her Thursday unveiling at the Tower of London of uniforms for Team Great Britain Olympics athletes. McCartney, who collaborated with Adidas on the athletic wear, credits the union flag as a key inspiration for the uniforms. “Something that was very important to me was to try and use that very iconic image but to dismantle it and try to soften it, break it down and make it more fashionable in a sense,” McCartney said to the BBC. Of course, McCartney, daughter of former Beatle Paul McCartney and the late Linda McCartney; former creative director at the Parisian label Chloe and head of her own fashion house since 2001, understands that criticism comes with the territory. Since yesterday’s Tower of London debut, some sthletes and fashion bloggers continue to complain about the lack of red in the team wardrobe and her “non-traditional” design of the union flag. 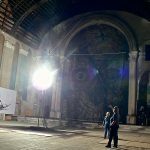 The annual survey of the best-attended museum exhibitions is out via The Art Newspaper and the top ranking goes to the Centro Cultural Banco do Brasil (CCBB). The Magical World of Escher, a free exhibition programmed at CCBB’s Rio de Janeiro space located in a former bank building in the center of the city, is the top 2011 show thank to it average of 9,700 visitors per day. Alexander McQueen: Savage Beauty is the top U.S. show with more than 8,000 visitors per day for the posthumous tribute to the designer by the Costume Institute of the Metropolitan Museum of Art, New York. The Hunger Games, Lionsgate’s first installment of a planned, four-film franchise based on Suzanne Collins’ teen novels, is off to an amazing start thanks to an estimated $25 to $30 million in ticket sales from midnight screenings as well as the additional 3 a.m. shows added to the special one-week, IMAX format engagement of the first installment in the planned four-film fantasy franchise. According to The Hollywood Reporter, The Hunger Games, director and co-writer Gary Ross’ adaptation of Collins’ near future tale about children who fight each other to the death on TV and sixteen-year-old Katniss (Jennifer Lawrence) who enters the games in order to protect her sister, looks to exceed the $138.1 million three-day opening last November for The Twilight Saga: Breaking Dawn – Part 1 and reach $150 million in debut weekend ticket sales.